Windows 10 Spring Creators Update will probably actually be released with a different name: Windows 10 April Update. Users who have installed build 17134 -- believed to be the RTM build -- have spotted a reference to the new name in Microsoft Edge post installation. This is not the first time this name has been suggested. Less than a week ago a Microsoft video emerged that made reference to Windows 10 April 2018 Update, and the new discovery in Edge would only seem to offer further proof. A server-side update delivered to Redstone 4 users sees the arrival of a new welcome page in Windows 10's built in web browser. 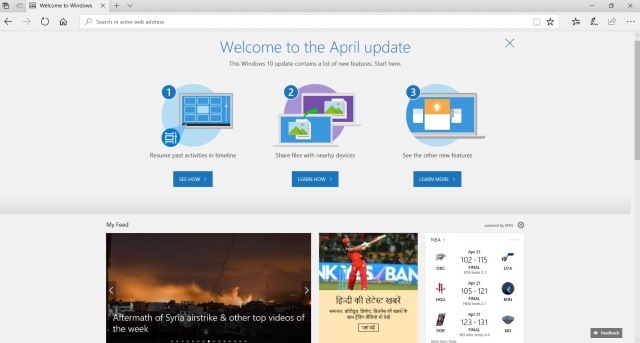 The page (first noticed by Windows Latest, and visible at the top of this article) says: "Welcome to the April update. This Windows 10 update contains a lot of new features. Start here." It then goes on to make reference to the timeline features and sharing options. I would take this opportunity that it also looks like the name "Spring Creator's Update" is probably no longer a thing (though it definitely was at some stage) - I'll update it on BF when we get something concrete about what its name will actually be. With the final version of the update expected to be publicly released very soon the name makes sense, but we'll have to wait and see what Microsoft's final decision is.